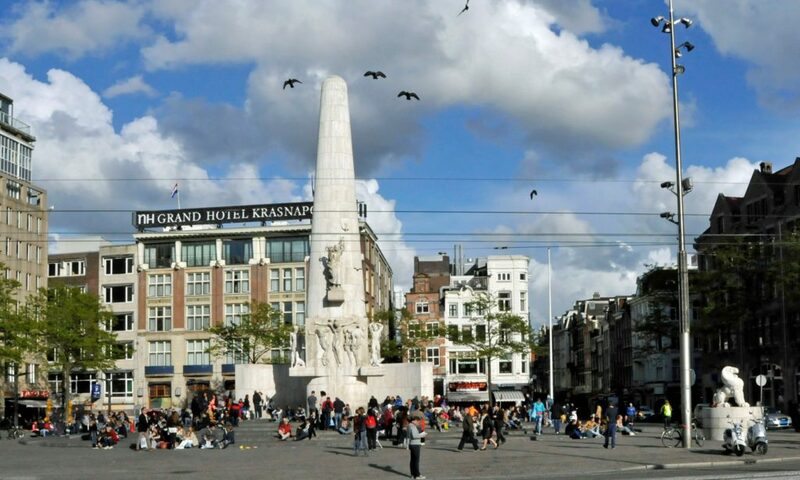 Dam Square is among Amsterdam’s most popular tourist destinations, featuring a controversial war memorial. In 1270, Dutch settlers built a bridge that also served as a flood control dam over the Amstel River near where it enters IJ Bay. Dam Square, a plaza west of the bridge, became the central market and cultural hub for the growing trading city of Amsterdam, reportedly named for the Amstel Dam. By the seventeenth century, the Dutch Republic dominated world trade and Amsterdam was the wealthiest city in Europe. Just east of Dam Square, De Wallen, Amsterdam’s famous and still active red light district, was entertaining sailors from around the world. In 1655, Amsterdam dedicated an enormous city hall along the west side of Dam Square, said to have been the largest administrative building in Europe at the time. On May 7, 1945, two days after Germany had surrendered control of the Netherlands, frustrated German soldiers sprayed machine gun fire into a crowd celebrating in Dam Square, killing at least 22 and injuring dozens more. In 1956, the government of the Netherlands erected the National Monument on the east end of Dam Square to honor the Dutch victims of World War II. Many citizens saw the monument as unnecessarily suggestive of the activities in nearby De Wallen. In the late 1960s, hippies from all over the world saw the monument as a symbol of Amsterdam’s well-known tolerance and began sleeping and engaging in all sorts of activities in Dam Square. Today, Dam Square is one of the liveliest public squares in Europe. The old city hall is now one of the three palaces of the Dutch royal family. Madam Tussauds Wax Museum, the first outside Britain, is on the south side. The hippies are long gone, replaced by fashionable shops and cafes, street performers and, of course, pigeons.